The Bar Choral Society’s Summer Concert will take place on Monday 8th of July 2019 in Temple Church at 7.30pm. Alongside countertenor Robin Blaze, the Choristers of Temple Church, pianists Iain Farrington and John Reid and The Percussion Ensemble of London, the choir will be performing Jonathan Dove’s Arion and the Dolphin and Constant Lambert’s The Rio Grande. Dove studied composition with Robin Holloway at Cambridge. He has become well-known for his operatic works, including Flight and The Adventures of Pinocchio, and he has also written a large number of pieces for choirs. Arion and the Dolphin, with its dramatic word-setting and vivid pictorialism, blends the theatrical world of his opera compositions with the distinctive textures and colours of his choral works. Constant Lambert was an English composer, conductor, and writer on music. A student of Vaughan Williams, he was the first English composer to have a work performed by the famous company, Ballets Russes. In his most famous piece, The Rio Grande, Lambert skilfully wove the disparate influences of Latin American habaneras, jazz, Delius and Duke Ellington into a vivid, evocative and highly distinctive colouring of a poem by Sacheverell Sitwell. Instantly successful after its first performances in 1928-9, The Rio Grande placed Lambert firmly alongside Walton at the head of a young generation of English composers. The Bar Choral Society’s latest concert was a sell-out performance of Mozart’s celebrated Requiem on 20th November 2018 in Temple Church. The choir were joined by Amy Haworth – Soprano; Ben Williamson – Alto; Nathan Vale – Tenor; Michael Burke – Bass and The Temple Players. The performance was supported by Close Brothers Asset Management. On 19th June 2018 at 7.30 pm at Temple Church the choir focused on two works by George Frideric Handel, his Coronation Anthems and Birthday Ode to Queen Anne. The choir was joined by soloists, Soprano, Amy Wood; Countertenor, James Hall; Tenor, James Way and Baritone, Richard Latham as well as The Temple Players. On 20th November 2017 in Inner Temple Hall the Society presented a lively concert of upbeat favourites from Broadway. Including music by George & Ira Gershwin, Leonard Bernstein and Stephen Sondheim, the choir took its audience on a whirlwind trip from “An American in Paris” to “Chicago” before telling a “West Side Story” in “New York, New York”. The concert was in support of the National Brain Appeal. On 11th April 2017 they performed Bach St John Passion. Written and premiered during his first year in Leipzig, the St John Passion is the leaner and more dramatic of Bach’s two surviving settings of the Holy Week narrative. In this distinctive performance, the choir was led by their Music Director and Conductor, Greg Morris and joined by Soloists James Way as Evangelist, Gareth John as Christus, William Towers Alto, Matthew Sandy Tenor and Andrew Rupp Bass. The choir was also joined by the chamber choir Collegium Musicum of London and the Temple Players. The Choristers of the Temple Church performed the soprano arias, while the choir took the role of a Lutheran congregation and sang the chorales, the emotional and theological heart of the work. On 17th May 2017, choir members also joined with the Parliament Choir to sing Walton Belshazzar’s Feast at the Royal Festival Hall with the South Bank Sinfonia. On 16th November 2016 in Middle Temple Hall the choir performed Joseph Haydn’s The Creation – more detail here. On 12th May 2016 in Temple Church the choir held an evening where the programme framed Brahms Alto Rhapsody with his glorious chorus Geistliches Lied, Wie lieblich sind deine Wohnungen (from German Requiem), and works from the great English choral tradition – more detail here. On 16th November 2015 in Temple Church, the Society held a concert with the programme: Handel Let the Bright Seraphim and Let their Celestial Concerts all Unite, Aria and chorus from Samson, Monteverdi Ave Maris Stella (from the Vespers 1610) and Vivaldi Winter from The Four Seasons and Vivaldi Gloria. The choir was led by their Music Director and Conductor, Greg Morris, and joined by soloists Grace Davidson Soprano, David Allsopp Countertenor, Rachel Ambrose Evans Soprano and by the Temple Players. Enjoy some photos from the evening here. 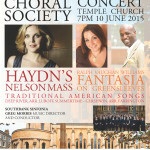 On 10th June 2015 The Bar Choral Society presented its third concert in Temple Church focusing on the great choral work by Joseph Haydn: The Missa in Angustiis (“Mass for troubled times”) or the Nelson Mass. Written near the end of his life, it is one of the six masses that are now seen as a culmination of Haydn’s liturgical composition. To mark the American Bar Association’s presence in London and its Magna Carta Conference, the concert complemented the Mass and Ralph Vaughan Williams’ Fantasia on Greensleeves with classic American songs Deep River, arr. Luboff and Summertime – Gershwin, arr. Farrington. Led by Music Director and Conductor, Greg Morris, the choir were delighted to be joined by soloists Elin Manahan Thomas Soprano, Ruth Massey Mezzo soprano, Matthew Sandy Tenor, DeAndre Simmons Bass, and the Southbank Sinfonia. The concert was generously sponsored by Harbour Litigation Funding. The Bar Choral Society’s second concert took place on Tuesday 18th November, in the Temple Church. We were delighted to perform, to a packed Temple Church audience, Gabriel Fauré’s Requiem and Ralph Vaughan Williams’ Five Mystical Songs with soloists Sarah Gabriel (soprano) and Roderick Williams (baritone). Enjoy some photos from the evening here. This concert was generously sponsored by Harbour Litigation Funding. The inaugural concert was on Monday 23rd June 2014. A programme of works by Bach, Mendelssohn, Mozart and Handel. Soprano soloist Grace Davidson joined the choir for Mendelssohn’s Hear My Prayer (O for the Wings of a Dove) and Handel’s I Know That My Redeemer Liveth. This concert was generously supported by Saunderson House. Rehearsals are on Mondays, 6pm-7.30pm (details on Membership page). Click above for an excerpt of the choir singing Deep River with the wonderul DeAndre Simmons, bass.